As Christian parents of two young girls, one of the greatest hopes Leanne and I have is that our girls, Mabel (3) and Estelle (1), will embrace Jesus at an early age, and will choose to follow Him all the days of their lives. And so we try our very best to both model Jesus Christ in our lives, and to speak about Jesus and His great love all the time. We want them to learn to pray, we want them to learn to love being a connected part of a church body, and we want them to know God’s Word, too. We’re convinced that those three things are vital to develop in children as we teach them to walk with Jesus. In Children’s Ministry and AWANA at EBC, we work to supplement the hard work of shepherding being done by all you who are parents, and I do believe it is truly helpful. But for each of us who are parents, we all bear a tremendous and sobering responsibility to shepherd the hearts of our kids and point them to the Chief Shepherd, Jesus Christ. I want to share with you all one shepherding tool Leanne and I are using, which Mabel loves, and I imagine Estelle will love, too, as she gets older. That tool is music from Seeds Family Worship. The people at Seeds Family Worship have taken Bible verses and put them to music. And it’s actually good! One other cool thing is that when you buy one of their CDs, they send you two copies, instead of one. That means you have one copy to keep, and one to give away to another family. Every time I get in the car with Mabel lately, she says “Can we listen to What Shall You Eat What Shall You Wear?” And she’s referring to the song from the album Seeds of Purpose, titled Seek First, which you can listen to on their website. It’s simply Matthew 6:31-34, put to music, and she could listen to that song on repeat all day long. Often after the song is over, I’ll turn it down and try my best to explain to her 3 year old mind the concept of seeking God’s Kingdom and His righteousness, and trusting Him to supply all our needs. Honestly, she really doesn’t understand very well. But I’m hopeful that as she continues to hear and sing the songs, as her little mind continues to develop, and as we continue to talk about what those words mean, that God will do great work through His Word in her heart, in Estelle’s heart, and also in mine and Leanne’s hearts, too. 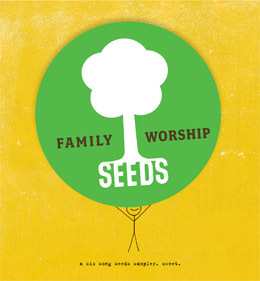 I’d really encourage you to consider getting some of the Seeds Family Worship music to use as a tool for helping to develop the faith of your kids. Here’s a link to their Youtube page, where you can get a good look at what to expect with their music. And here’s one song in particular that I think is great. Whether this music is helpful to you or not, I hope you who are parents are talking about and considering what things you can be doing to help your kids see and know Jesus. What a beautiful treasure God has entrusted to us in our kids! May we take on the mission of shepherding our kids with great excitement and intentionality!